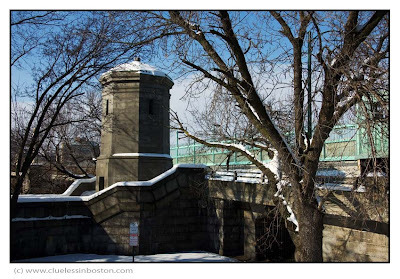 Start of the Longfellow Bridge. I really like your shots, great color, framing and perspective. You make ordinary subjects pop! What camera are you using if I may ask? I love the effect of snow atop stone. Nice shot. great angle and nice perspective. i feel like i am walking by this scene when looking at your photo. Brattcat, it is a nice effect and certainly caught my eye. Julie, thanks for the nice comments. Ken - I use a Nikon D40 and do some minimal post processing with Photoshop - levels, curves, and sharpening. Nancy, I'm with you. I just know what I like and all the technical stuff isn't necessary for an opinion. I very much like this photo of the Longfellow Bridge. I'm trying to think of where it might be in Boston. I think I'll have to look at a map! Is this the bridge that they call 'salt & pepper'? EGTG, this bridge connects lower Cambridge Street near Mass. General Hospital with Kendall Square Cambridge (MIT). Katie, yes, this is also known as the Salt and Pepper Bridge.